In my furthest dreams I never would have imagined myself going to a "business meeting" at Castello di Brolio, in the heart of Chianti country. And on a bike. And on a day as beautiful as today. It's days like this that make all the excrutiating growing pains so bearable. It's days like this that make me feel so gutterally, so umbilically attached to this land. It's days like this (and I have to admit there are plenty of days "like" this) that have crystallized my decsion (or my "call") to settle here. Leif is my good friend, my mentor, my coach, and has become kind of like a partner. He's been like a guardian angel to me ever since I met him a year ago. We've become good friends, great friends, nothing more, nothing less. Leif is the one who "noticed" me, took me under his wing, opened up the doors for me, took me on the road, introduced me to all the local people in the touring business, and we've spent thousands of kilometers together on the road. Today he took me to Castello di Brolio, where he had an appointment with their marketing folks to collaborate with them regarding some 2010 wine tastings and castle tours that he is organizing for his next year's tour clients. It was an all-day, 90 mile adventure on the bike, at a time of year when Chianti land really shines. Most of the vineyards have already finished their vendemmia (grape harvest) and many of the vineyards are sending their grape skins and seeds to the grappa distilleries. What does this mean? It means that if you're on your bike, you get blasted with an intense smell of wine permeating the air all day long!! And you see these tiny little miniature vechicles, reminiscent of Matchbox trucks, bringing grapes to the grappa factories all day long! It's a pretty special and intersting time of year. The tourists are all gone and Tuscany starts feeling cozier. Being the start of my second year living here, it is begining to feel more and more like home. I've seen the seasons change once, and I am seeing them change again. I am feeling more established, and less like a newcomer. It was pretty cold out this morning when we started. I even had to wear a neck warmer and face mask. But by 11am, it was already in the low '50's and the sun was shining over a bright blue sky. We went by way of Galuzzo to Ferrone, where we had a cappucino and then on through Greve to Panzano, where I told Leif that I didn't think that I was going to be able to continue the fast pace to make it to the meeting on time, and I was really wondering if I would be able to do the whole 90 hilly miles. The cold weather was draining my energy and I've been "out of condition" over the past couple of weeks while my bike was in repair, and while I was busy having fun in Capri. But, instead of letting me turn back, he called the castle and asked them if we could be an hour late. You don't usually have to ask permission to be late for anything in Italy, but he did. Anyway, this took the pressure off, and we were even able to stop in Radda for a quick lunch where I accidentally mistook the sugar for cheese which didn't go too well with my tagliatelle. Poor Leif did a "monkey-see, monkey-do" and dispensed a spoonful of sugar over his ravioli di tartuffe. It was an expensive mistake! The pasta hit-the-spot. I am becoming more conditioned to doing things like eating a real meal during a ride, and actually relaxing. When you're a bike tour guide, you have to do things in a very different way, because most bike tourists don't come to Tuscany just to zoom by all the magnificent scenery and not see anything. They come to taste the culture, to be coddled, entertained, and to be fascinated by the wine, the food, the scenery. 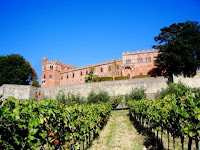 I had read about the 1,000 year-old Castello di Brolio in my casual studies of Florentine and Sienese history, and knew a little about it being the home of the Ricasoli family, who produces Tucany's best and oldest Chianti wines, and who established the original formula that forms the basis of what is known today as Chianti Classico . As we approached, I was pretty startled by its enormity and its commanding position on a promontory in the southern Chianti hills. Now I understand why it was such a strategic stronghold, having been possessed and re-possessed by so many kings, monarchs barrons and popes of Italian history. Upon entering the winery, we were greeted by the reception staff and guided into the main tasting room, and then to the marketing offices, where Simone, the sales director, Leif's contact, greeted us. Leif introduced me and we engaged in a dialogue regarding how they can customize some wine-tasting tours that Leif is planning for next year. Then Simone announced that she is pregnant, and introduced us to the woman who will be taking her place. I was astonished to meet Jamie Biagi.....who also worked and lived in NYC at JPMorgan Chase. We had alot in common to talk about. It was indeed a surprising encounter. We exchanged contact information and will surely be seeing each other again in the future. Riding back home I got a second wind and never bonked like I thought I would. We stopped in Panzano for another shot of espresso. As we rode, I kept on thinking about how much I would really like to take more photos of the magnificent scenery, which I never seem to be able to get enough of. But, as any cyclist knows, by the time you stop to take the photo, the angle, the perspective, the opportunity to capture the moment that you just saw through your eyes...is gone. You can't take photos of this. You are riding through a multi-dimensional panorama that is impossible to capture in a photo. But the memory is permanent and could never be explained or appreciated by anyone who isn't there, sharing the vision and the experience with you at the very same moment. In one way, I regret this being true, because others cannot understand. And in another way, I just have to thank God for giving me this special, if not solitary, perspective.